of healing with plants providing us with a huge vari-  than it can replace. body. 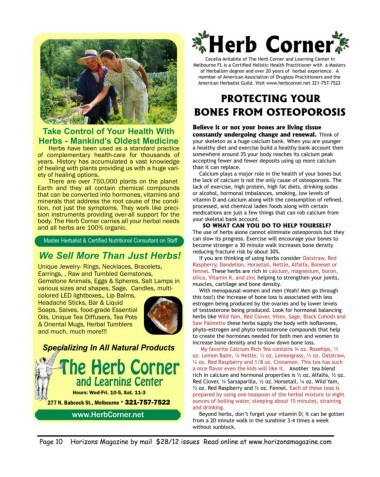 The Herb Corner carries all your herbal needs  your skeletal bank account. and all herbs are 100% organic. SO WHAT CAN YOU DO TO HELP YOURSELF? We Sell More Than Just Herbs! reducing fracture risk by about 30%. Gemstone Animals, Eggs & Spheres, Salt Lamps in    muscles, cartilage and bone density. increase bone density and to slow down bone loss. and Learning Center                    rich in calcium and hormonal properties is ½ oz. Alfalfa, ½ oz.